California artist Ray Roberts latest Native American-themed paintings revolve around early Navajo blankets, some dating back to the 1860s. 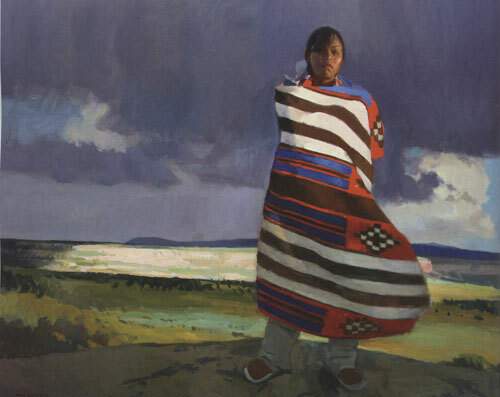 Ray Roberts, High Desert Warmth, oil on canvas, 30"x40"
California artist Ray Roberts latest Native American-themed paintings revolve around early Navajo blankets, some dating back to the 1860s. The figure in this grouping become models of these cultural icons and the landscape their runway. The majority of blankets shown are based on Roberts’ access to the extensive collection of Mark and Kathleen Sublette of Medicine Man Gallery, which will present Roberts’ new work in its Santa Fe showroom through August 16. Roberts relies on reference photos and his knowledge of these detailed blankets and the colorations to provide a starting point. Some of the new oil paintings reflect the artist’s internal dialog about red and green because that relates to how we see color. “It’s the way we see light optically as opposed to primary colors and the more widely accepted approach to painting,” he says. 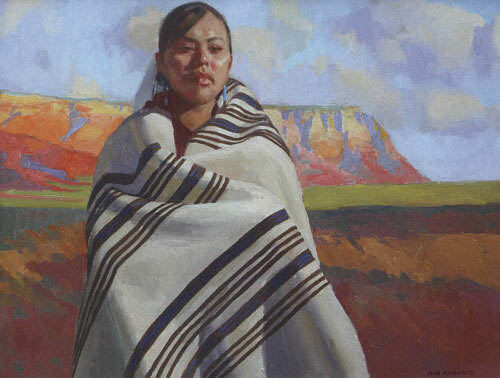 Ray Roberts, Transitional, oil on canvas, 30"x24"
Transitional and Navajo with Transitional Blanket, two high-key pieces of similar size and format, contain these warm colorations and a standing solitary figure looking straight ahead wrapped in a transitional blanket. The title refers to the design pattern circa 1890s. Dr. Mark Sublette of Medicine Man Gallery says, "Versatlity best describes Ray Roberts painting ability. An artist whose style can seamlessly switch between a great landscape and contemplative figurative work without ever losing the essence of the West." In other works, Roberts challenges his abilities to capture light and atmosphere in a variety of weather conditions such as storms, wind, bright light, evening, etc., as illustrated in High Desert Warmth in which he depicts a blanket blowing in the wind as a storm approaches. In Evening Warmth he depicts inclement weather yet makes the lighting very ethereal. 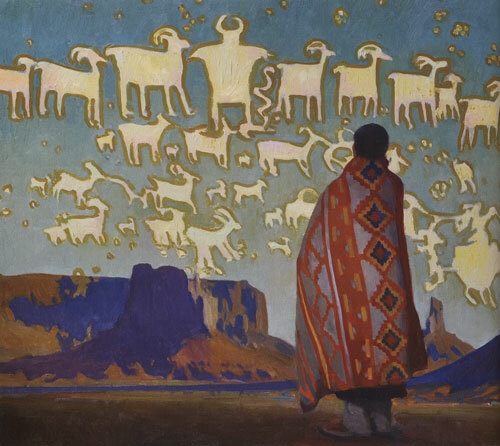 Ray Roberts, Indigo, oil on linen panel, 18"x24"
The artist also challenges himself with a new motif in the Southwest genre integrating petroglyphs with a contemporary figure in the landscape, as illustrated in Painted Stories. Ray Roberts, Painted Stories, oil on canvas, 24"x36"
Roberts hopes this collection resonates with others who share his appreciation of the artistry and craftsmanship of these blankets, the Diné, their land and culture. “I want collectors to look at the paintings as concepts and visages somewhat beyond the two-dimensional surface of the painting. I try to work that direction in all my work,” he says. 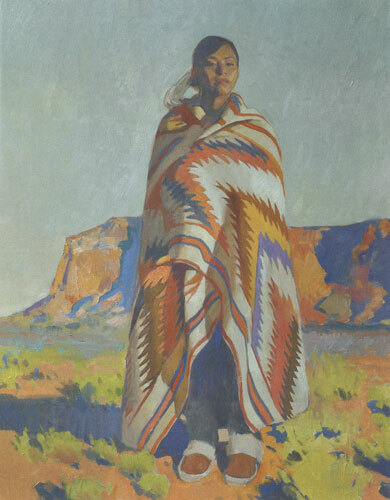 Roberts is quick to credit the Navajo weavers who created these masterful pieces that are now the subject of his canvases.